Although there are lighthouses located all along the coast of the United States, lighthouses have long been closely associated with Maine. Perhaps it has something to do with the state's maritime heritage or perhaps it is because of the romantic beauty of these towers standing proudly over Maine's rocky coastline. 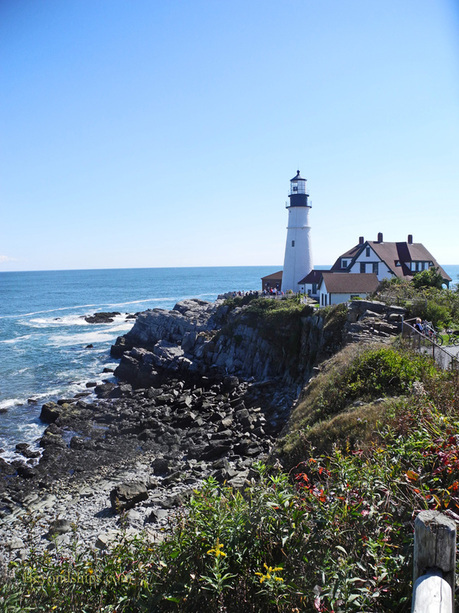 Cruise passengers have the opportunity to sample Maine's lighthouses in both of the state's most popular ports of call - Portland and Bar Harbor. Most cruise ships as well as independent operators offer lighthouse tours. Visiting the lighthouses in the two ports is quite different. Portland is a commercial center and the lighthouses surround a developed harbor. Most can be visited by land. Bar Harbor is still quite wild and the best way to see the lighthouses on their small isolated islands is by boat. 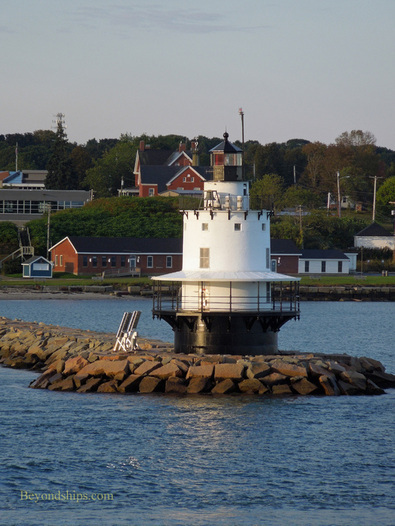 This essay shows only some of the lighthouses that can be seen in Portland (this page) and in the Bar Harbor area (next page). 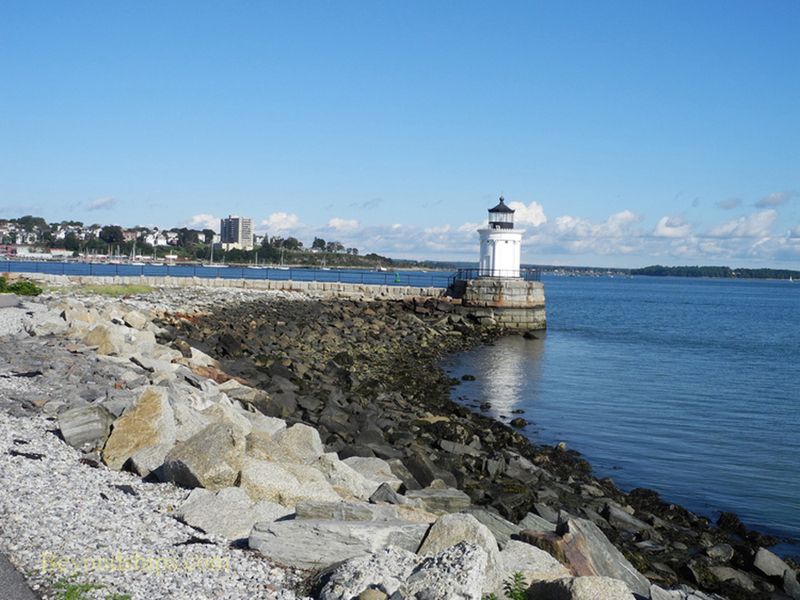 The Portland Breakwater Lighthouse, popularly known as "Bug Light" came about because of a storm in 1831, which inflicted massive damage on Portland harbor. The federal government decided that a breakwater should be constructed but because of delays in authorizing the necessary funding, the breakwater and its lighthouse were not completed until 1855. The current structure, designed to look like an ancient Greek lighthouse, was built in 1875, following additions to the breakwater. It was automated in 1935 but after it was deactivated during World War II, the light remained unlit until 2002. 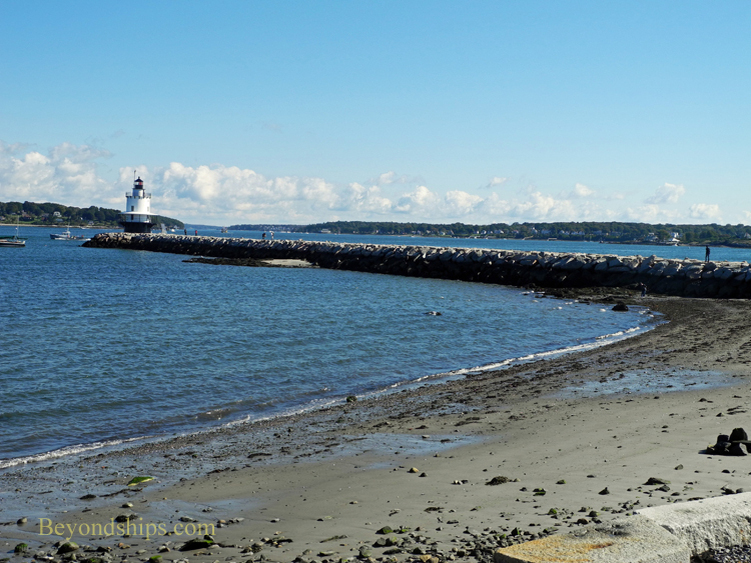 Bug Light is located in Bug Light Park across the harbor from the cruise ship terminal. It is open to the public. Not far from Bug Light is the Spring Point Ledge Lighthouse. The lighthouse marks a rock ledge that caused numerous shipwrecks before the light was built in 1897. 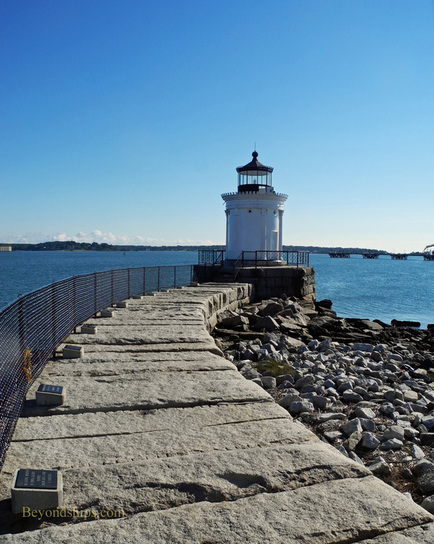 For half a century, the lighthouse stood in isolation in Casco Bay. Then in 1951, a breakwater was constructed to connect the lighthouse to the mainland. The attachment point is the site of Fort Preble, a 19th century harbor defense, portions of which are still visible. The light was automated in the 1960s and remains in active operation. It is open to the public. One of the most classic lighthouses in the U.S., Portland Head Light has been the subject of numerous paintings and photographs. In addition, thousands of visitors come to Fort Williams Park each year to see it. 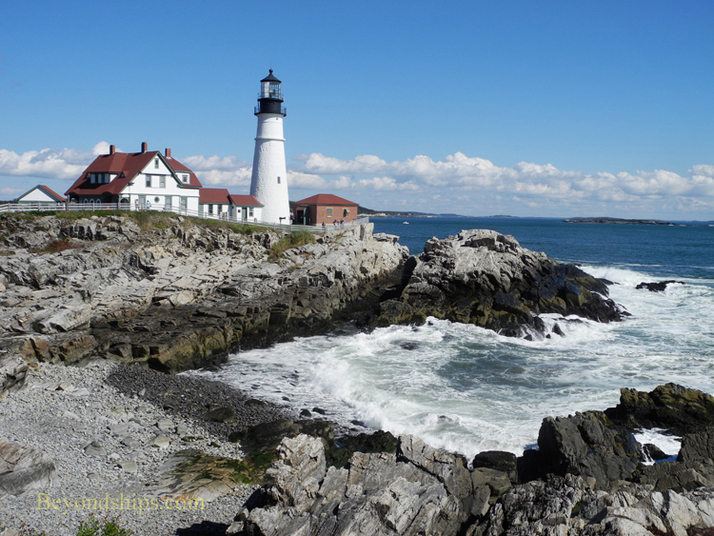 The Portland Head Light was the first lighthouse completed by the United States government and began operation in 1791. As shown in the exhibits in the Portland Lighthouse Museum, which is located in the keeper's house, the lighthouse has undergone numerous changes over the years with the tower being raised and lowered several times. One of the last lighthouses to be automated (1989), the Portland Head Light remains an operational aid to navigation. 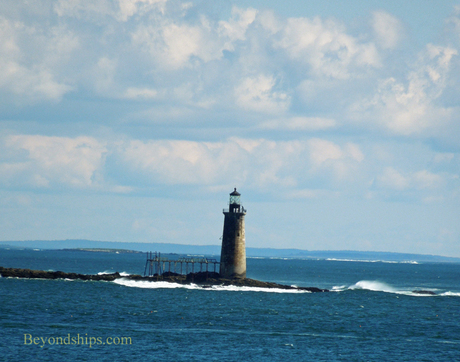 Looking out to sea from Portland Head Light you can see another lighthouse, a 72-foot tall granite tower that seems to be standing on a small rock far from any land. After many shipwrecks on the rock ledge that lies just below the surface of the sea during high tide, Congress appropriated funds for a lighthouse. It was completed in 1905, automated in 1959 and remains in service today. Ram Island Light is closed to the public but can be seen from cruise ships entering and leaving the port as well as from Portland Head Light.